Yesterday Mike and I went on a green onion hunt. For some reason Sundays are not the day to buy green onions. I guess Mondays are the days that stores restock? Anyway, at first, we were at this little Japanese market and I was going to buy some Tokyo negi, which is kind of like a giant green onion. But, I was too snobby about it because I wanted tiny, cute green onions, so I was all like, nah, let’s get our green onions somewhere else. We happened to be going to another grocery store anyway – otherwise I would have sucked it up and gotten the Tokyo negi – but when we got there the green onion section was cleaned out. I asked the helpful man who was restocking cantaloupes (why they have cantaloupes and not green onions, I don’t know) and he said that there were no green onions in the back and that they were out of a lot of things. After all that, these guys happen to have green onions in them because I found a half a bunch languishing in the crisper. But, if your town has a green onion shortage too, you can skip out on the green onions or maybe substitute in some finely diced yellow onion for a bit of onion-y goodness. 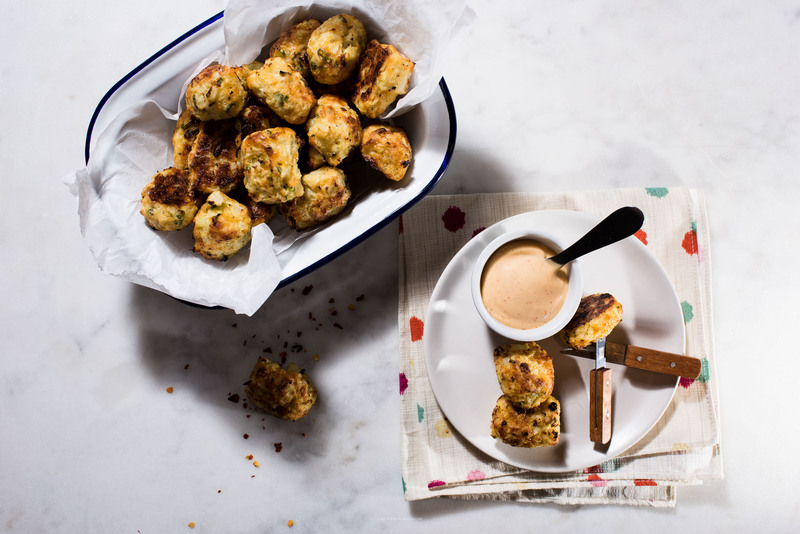 These tots are based off of these broccoli tots, which are absolutely delicious, but if you’re looking for a way to get some cauliflower into your life, these tots are calling your name. Crispy and crunchy on the outside, creamy and cheesy on the inside, these guys are perfect when you’re feeling the tot craving. 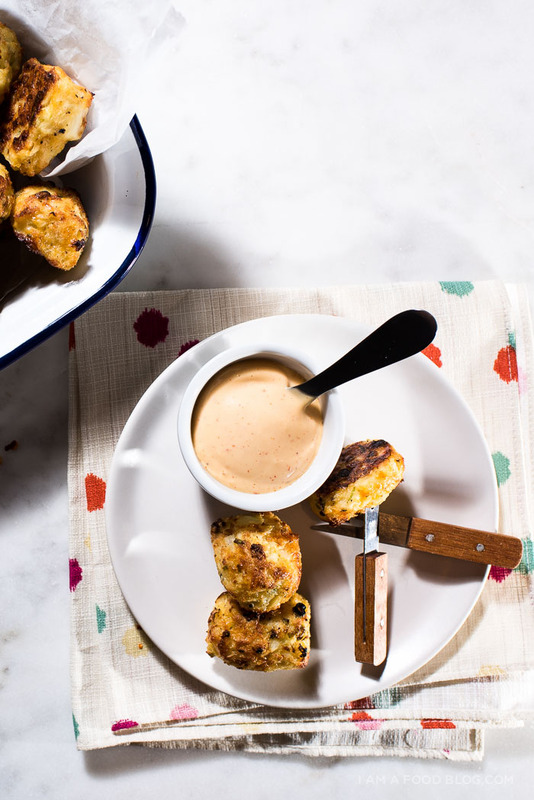 Dip them into a bit of sriracha mayo (literally sriracha and mayo mixed together, to taste) and you’ve got yourself a heathy(ish) snack. Yay vegetables! Blanch the cauliflower in boiling water for 4-5 minute then immediately shock with cold tap water or an ice bath. Drain very, very well. 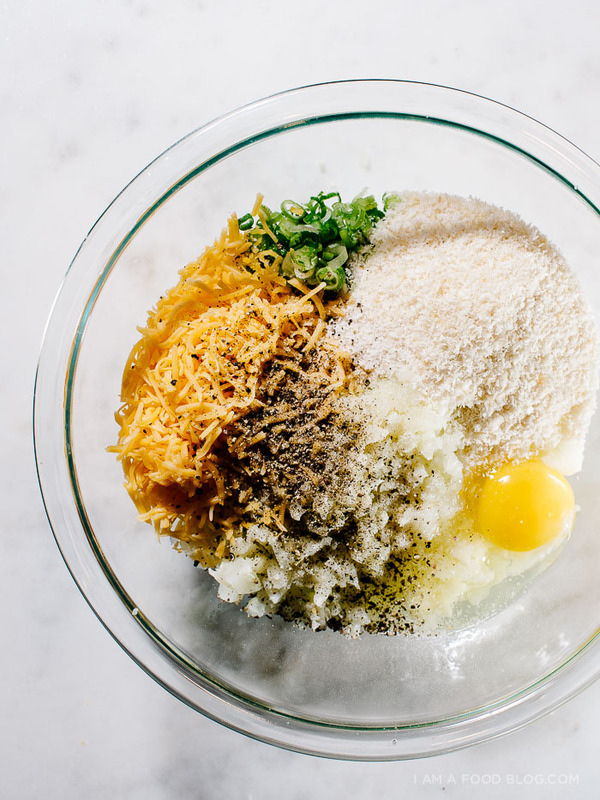 Chop finely and mix throughly with the egg, green onions, cheddar, and panko. Season generously with salt and pepper. 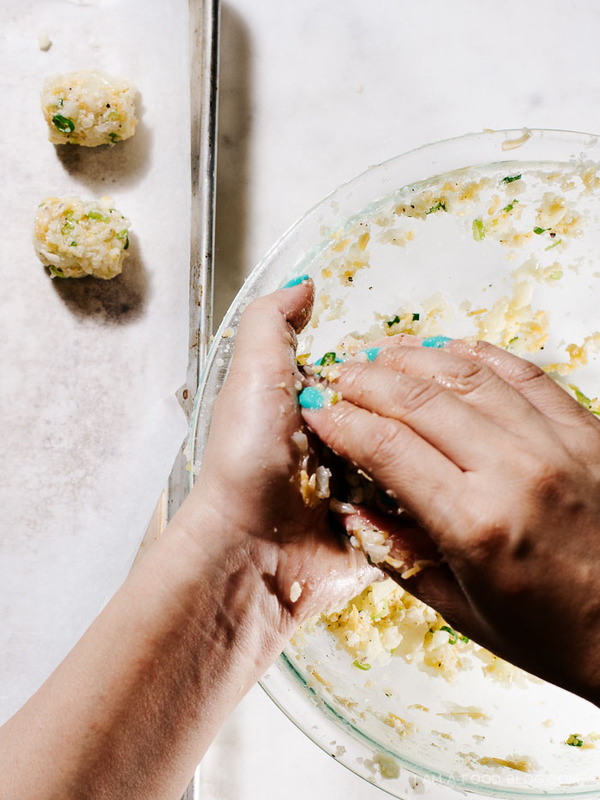 Scoop about 1.5 tablespoons of mix into your hands and shape into a tater-tot shape. It helps if you keep your hands wet while you’re shaping. Place on your prepared baking sheet. Repeat until all the tots are made. Bake until golden brown and crispy, 18-20 minutes, turning the sheet half way. Broil on high for 5 minutes (keep an eye on the oven while doing this) for a bit of golden brown goodness. Remove from the oven and enjoy hot with ketchup, sriracha, or sriracha mayo! Note: I used a mini ice cream scoop to keep the sizes consistent. If you like, you can just scoop out the tots and bake without shaping into a log. I loved the broccoli version and now I’m loving these! Yum!! What is with the random food shortages in this city?? There was a mascarpone shortage back in Dec and that was actually really bad for us because we need more than 5 kg of mascarpone for the production of one of our cakes at work! We ended up finding some, but it was touch and go for a while. These look delish! I’m usually not a big fan of cauliflower but I have a feeling I would like it when combined with cheese.. Yes! 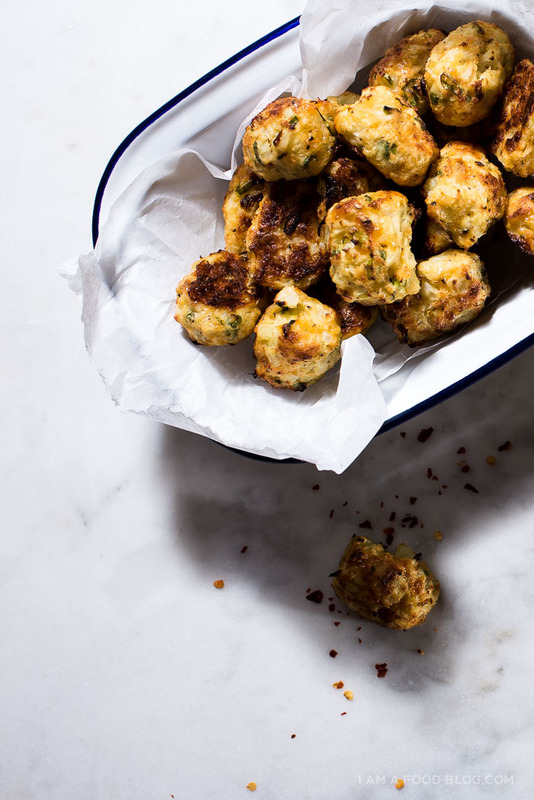 Cauliflower is my absolute fave so I’m all over these tempting little snacks! Hahaha your green onion quest was pretty funny. I once had that with blueberries, went to 4 different places and nothing. It felt like there wasn’t a single blueberry in NYC! Also really like this tater tot alternative! Oh, okay. This looks like a game changer. I feel like I can never find ingredients when I need them the most! Usually they’ll just be chilling there, no one is buying them, and then bam! When I need them, they’re out. These tots are so cute! I have run into this same problem before. I went to two stores and couldn’t find what I needed. At that point nothing else would do, even though I could have substituted with something else. The tots look delicious. It’s a smart way to get more cauliflower in your diet. I’ll have to give these a try. Dudddde these look so so so amazing! Sorry you had such a challenging grocery day but tbh it was obvi worth it! Yaaaas. oh man. Teddy is going to get a little cauliflower tot action coming his way soon!!! These healthyish tots look so good. I am definitely going to have to give them a try with the green onion hopefully. Hi there! I love tots, but unfortunately, they aren’t the healthiest of choices! So I love how you made a healthy version of it, which I’m sure will taste great! 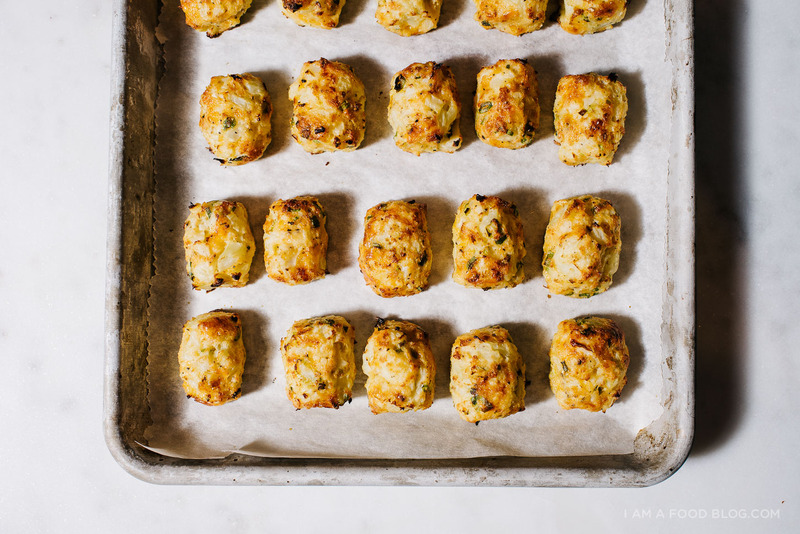 The only question that I have about this recipe is how long does it take to shape all the tots? I feel like it would take hours to use up all the “filling!” I was thinking that if you ran out of time and couldn’t finish shaping the tots, could you put the mixture in the fridge or freezer? What do you think? you can definitely hold the mixture in the fridge. or if you don’t want to shape them as tots, you can press them into a mini muffin tin and bake, or just scoop out little mounds. hope that helps! Oh Wow! something fried is perfect for the cold wintery nights!! :) Looking forward to trying this out. 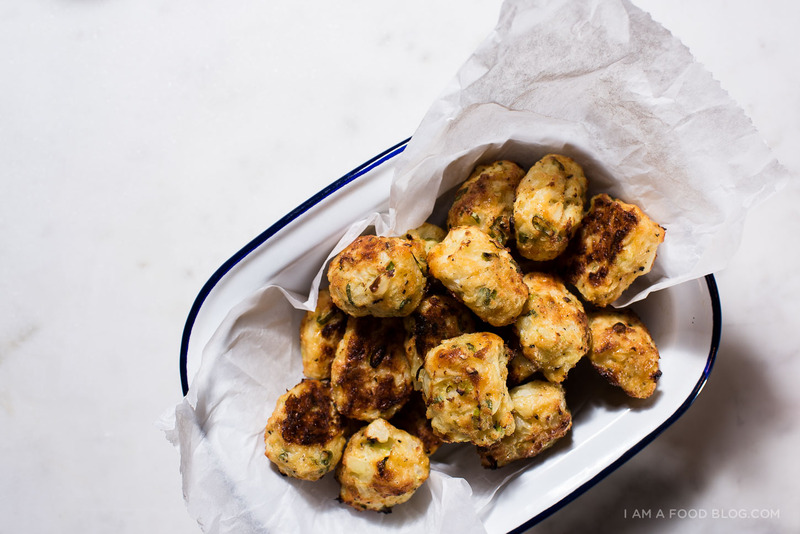 What a lovely blog, I am enjoying your blog and can’t wait to try the cauliflower tots. Always looking for other ways to use cauliflower. I can’t decide which is better? Your images? Your great personality shining through or the just fabulous recipes. I really enjoy your blog and look forward a great culinary year. 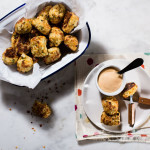 I typically make broccoli cheese tots but now I need to switch it up! Pinned for later recreation. These look amazing ! I’m definitely going to try these out! I’m a cauliflower junkie, love it, love it, love it. This is my first time on your food blog and I have to say, I love your whimsical personality and fun loving life! I will definitely bookmark you blog on my favorites. You are an inspiration to me as a new food blogger. I’m so new that I am about to publish my first post.. Thank you for inspiring me! Another winner! Having a “let’s check out Steph’s blog day”! Here’s a green onion/scallion tip you may or may not heard of and that is when you are down to your last few green onions and they may (or not) be on their way out you can cut the greens down to say 2 inches or so and pop them, root down, in a glass (or short mason jar) of water and they regrow. I scooped with a 1/4 cup for a slider look. Chilled in the fridge for an hour to keep shape. Smoked in the BBQ for one hour with pecan wood, then baked at 400 for 30 minutes. Bacon wrapped sounds like a good idea too.